My name is Daniel Jones, I have a 1973 Hydrodyne twin rig powered by the original 1150 Mercury Inline 6 outboards. When I was going through the internet trying to find information on how to restore my Dyne I came up short. There was only one site out there to go to and it was for all classic boats not just Hydrodyne's. Knowing that there was still a following behind this boat I put up the site. 2 years later the forum started to show some activity as people found it through searches mostly from Yahoo which is still true to this day. Using some old footage that my Dad had from his show skiing days back in guam while in the Navy I started to add content and spruce up the site to make it an attractive stop for fellow Hydrodyners on the internet. So I would like to be the first to welcome all who find this site and urge you to join the forum (when I say member it means that you belong to the forum) About the only advertisements you will see on this site are for the ski teams that use the Dyne style hull or for apparel which I am working on. Hydrodyne is still a trademark name and I am working on trying to get permission just for apparel and other small items that will promote the site and the classic Dynes. 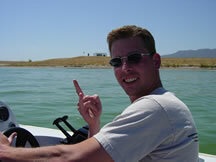 •Hydrodyners.com is not affiliated in any way with the Hydrodyne Boat Company or its affiliates. Hydrodyners.com does not market or sell any Boat or Boat related items. Hydrodyners.com is not permitted to allow other boat companies to advertise on its system to protect the trademark owner. •Hydrodyne is a registered trademark and property of the corporation for which it is trademarked by. The name Hydrodyne is solely used in this web-site to represent the type of boat for description purposes only and not for any other reason. •Should any material with in this site violate respective trademarks please email ADMIN@hydrodyners.com with a description of the violation and it will be taken care of promptly. •Hydrodyners.com is not responsible for posts made by its users but does retain the power to remove posts that violate any trademark and will remove any un cited material that does not have the proper permissions from the author. •Hydrodyners.com is not a business and has no intention of trying to create a business model to make a profit. The basis of this site is to provide a space on the internet for Hydrodyne Boat Enthusiast's to communicate and learn about the boats that made up the former Hydrodyne and Crosby Boat Companies. •All content sent to Hydrodyners.com i.e. Videos, Pictures or other undefined content becomes property of Hydrodyners.com and you grant full right for Hydrodyners.com to use said content on the site without compensation or recognition. Should you require recognition you must have a valid email sent from Admin@hydrodyners.com with source code reveling the message originated from the wswd.net mail server or a written and signed content agreement form before the content is publicly available on Hydrodyners.com, Showskiers.com, WSWD.net, Infogoat.com or any other site operated by wswd.net.